There are many reasons why babies die either before or shortly after birth. The baby may not be capable of life outside the womb, there may be a congenital abnormality causing death before or after delivery or other complications such as eclampsia or lack of oxygen. The death of a baby at any stage of pregnancy can be a very real loss to the parents and family. From the very start of your pregnancy you will have begun to include this new baby in your future plans. A precious life has ended, whether you lose the baby through early or late miscarriage. 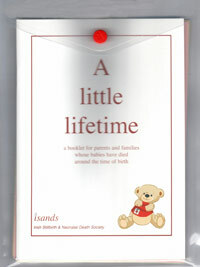 Our booklet, A Little Lifetime has been written mainly for parents whose babies are stillborn or die shortly after birth; however, if you have had a miscarriage you may identify with much of what is said and what other parents have found to be helpful. You may have been told that your baby has a serious abnormality and will die during pregnancy or after birth. Conditions such as anencephaly, spina bifida, hydrocephalus, Potters syndrome, Edwards syndrome and certain heart defects may be detected by a scan. It may help to find out more about your baby’s condition to prepare you for what to expect. When you are given such news it is normal to feel totally shocked. You may begin to ‘grieve’ for your baby even though he or she is still alive. You will have to think about telling your family and friends the sad news and preparing them for the birth and death of your baby. You may need extra support for the duration of the pregnancy. Many parents have found that being aware of their choices and making some plans before the birth allowed them to spend as much time as possible with their baby when he or she was born. You may have found out from a routine scan that your baby has died before being born. You may have been worried and hoped that the scan would reassure you that your baby was all right. Very often the bad news is written on the faces of the staff in the hospital long before they say anything. Being told that there is no heartbeat confirms your worst fears. It is very hard to accept that the son or daughter that you have been expecting, the baby whom you already know and who has lived inside you for many months, has died. Your immediate reaction may be to want the baby delivered as soon as possible. The question of how and when your baby will be born is something that you should discuss with your doctor. It is usually safer to wait until you go into labour naturally and ask your doctor to explain the reasons why. It will be a difficult time, but it will give you an opportunity to prepare for your baby’s birth. Going home from hospital knowing that your baby has died and that you still have to give birth can be a very frightening time. Physically you may not feel or look any different at all, and it may be hard to accept that the scan was correct. You will miss your baby kicking but you may still have gentle movements, which can be confusing for you. If you have other children and they know about the pregnancy, try to explain what has happened. It is best to tell your family and close friends about the baby so that they are aware of the situation. You may feel very sad and isolated, you may want to have somebody to talk to, or you may want to be alone. It can help to talk to somebody who has been through a similar experience. You can contact A Little Lifetime Foundation at the telephone number listed at the back of this booklet. In some cases labour has already begun and it is during labour that it is discovered your baby has died. Even with new technology and close monitoring by hospital staff there are babies who die during labour, just before or during delivery. Trying to cope with the birth and death of your baby at the same time can be very confusing. Wondering what your baby will look like and the fear of not knowing what to expect is normal. Don’t be afraid to express your fears. When the baby is born you can either ask one of the nurses to describe him or her to you, or ask to see a photograph first. Then, when you are ready, you can hold your baby. When you see your baby for the first time, you will realise that you have given birth to your son or daughter. You will be able to see what he or she looks like and you may even experience joy at having given birth. The time you have with your baby shortly after delivery is very precious. Hold your baby for as long as you like and look at every little detail. Although it may seem like an intrusion at this time, it is lovely to have some photographs taken of your baby shortly after birth. This is your baby, a baby who will never be replaced and who will have a special place in your heart. may be helpful to you in creating memories of your baby. It is very difficult to accept that in spite of advanced medical knowledge and modern technology, babies are born with conditions that cannot be cured. Your baby’s condition may be diagnosed during pregnancy or immediately after birth. Sometimes everything may seem normal for a time and you may be celebrating the birth, only to be told that your baby will not survive. Some babies only live for minutes or hours after birth, giving you little or no time with your baby. Nothing can prepare you to face the birth and death of your baby in such a short space of time. Disbelief, shock and a feeling of numbness cloud what you hear and feel. Even though you may not have had the opportunity to care for your baby while he or she was alive, there is still time before the baby’s funeral to involve your family and other children, and create some special memories. Seriously ill babies will be rushed to the Special Care Baby Unit and you may only get a quick look at your baby before he or she is taken away. The staff will usually take a photograph of your baby and bring it to you as quickly as possible. The doctors and nurses will tell you what is happening and explain your baby’s condition. They will prepare you for what to expect when you first visit the unit; they will tell you what your baby looks like, if he or she is attached to monitors or a ventilator, and how his or her condition is being treated. It may be necessary to transfer your baby to a Paediatric Hospital or Unit for tests, treatment or surgery. It is very distressing to be separated from your baby; you may feel very isolated and helpless knowing your baby is so ill. When you are ready to visit the Special Care Baby Unit (or Paediatric Hospital/Unit) you may feel very nervous and uncomfortable in such strange surroundings. It will be very warm and you may feel weak. The staff will explain the functions of the equipment and this can ease your fears. You may not be able to hold your baby straight away but you will be able to touch and talk to him or her. Where it is possible, you will be gently encouraged to hold your baby and help in his or her care. You may be nervous or afraid of hurting your baby and feel it is better left to the professionals. This is a normal reaction; however, helping to care for your baby now will be an important memory for you in the future. Sometimes one parent may want to be in the unit with the baby all the time, while the other is reluctant to see and get to know the baby. These are both normal reactions but this may be the only time you can create memories as a family while your baby is alive. Parents also worry about how their other children will react when they bring them to see their brother or sister in the intensive care unit. Most children will not find the unit as frightening as adults. The staff will help you explain to them about their brother or sister’s condition and answer their questions. Involving your children is very important. Their memories are precious too and they will always remember you wanting them and helping them to be included. Spend as much time as you can with your baby and if possible include other family members so they too can take part in your baby’s short life. Try to have photographs taken of all the family together. Going home without your baby, knowing that he or she may die at any time is very difficult. The staff in the intensive care unit or nursery will assure you that they will contact you immediately if your baby shows signs of deterioration. You can always contact them by telephone day or night for a report or simply to get reassurance. You may be anxious about how your baby’s death will occur. The doctor will explain to you what will happen. You may not have been able to hold your baby before because of the tubes and monitors connected to him or her. Some or all of the support systems may be removed so that you can now hold your baby as he or she dies. You may want to be alone with your baby or you may wish to have family members present. Unfortunately, if your baby’s condition deteriorates very quickly you may not have time to go to the hospital. You can be reassured that your baby will not be alone, as the staff who have nursed him or her will be there. They too will be upset when your baby dies. You might find it helpful to talk to them again at a later stage. In some cases it is possible to take your baby home for a day, a weekend or for whatever time there is left. You need to think about this carefully, as your baby may have special needs for his or her care. The staff in the unit will show you how to manage this special care. It is also helpful if you contact your public health nurse, who may be able to help in a practical way with the baby’s care. The nurse’s visits may give you support. Caring at home for a baby who is going to die is very hard and the isolation from all the support systems in the hospital may make it difficult to cope. However, on the other hand having your baby at home gives you the opportunity to do everything you can as a family. It gives you a chance to take photographs and videos in your own home, making a little lifetime of memories to treasure afterwards. Let your family and friends know if you would like them to visit. They may be unsure of what to do and may appreciate knowing how they can help. You may realise that your baby’s condition is deteriorating and you may want to take him or her back to the hospital, this is entirely up to you. If your baby dies at home it may be frightening, but it will be a very special memory for you to have. It may be possible, if there is time, to have someone who has cared for your baby there with you. When your baby dies you will need to tell the hospital or your family doctor. If you choose to tell your doctor, he or she will need to certify that your baby is dead. A post-mortem may be requested. Consider the request and ask any questions you may have before making a decision. You may still take your baby back to the hospital at this stage so that you can prepare for the funeral or you may decide to do this at home. Take your time in making these decisions. or email- info@alittlelifetime.ie if you need to discuss any details from information above. The whole family has been preparing for the baby’s birth and it is the whole family that experiences the baby’s death. These few days will be the only time you will have together and so it is important that family members are encouraged to see and hold your baby and family photographs are taken.